In this deli-style pasta salad, every fork full will have something delicious to keep digging for more. 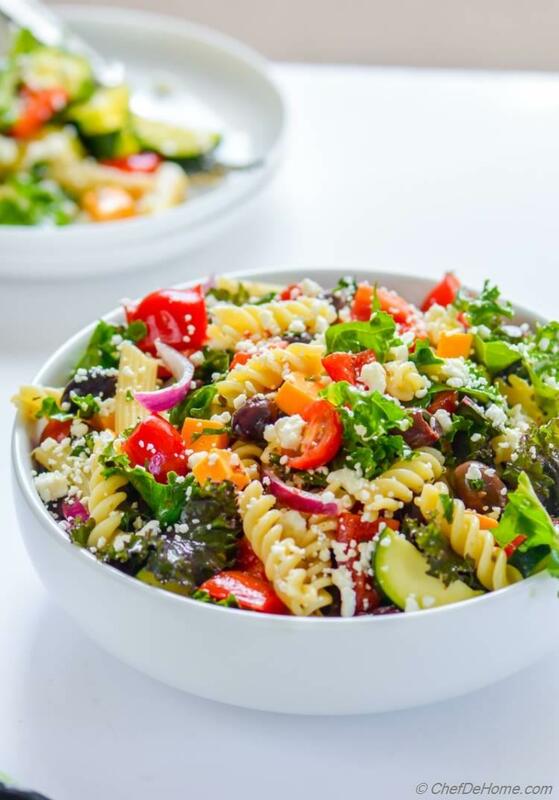 If you are fan of deli-style pasta salads, this vegetarian pasta salad will be your new favorite! I promise! Specially great to pack for potlucks or family trips, ingredients in this pasta salad are robust and also benefit from sitting in vinaigrette. Now, what else would one want from potluck food? Food that stay fresh long, (don't wilt or get soggy or mushy), are easy to carry, can be served without reheating and some which everyone can enjoy! Does this look that tempting or what? 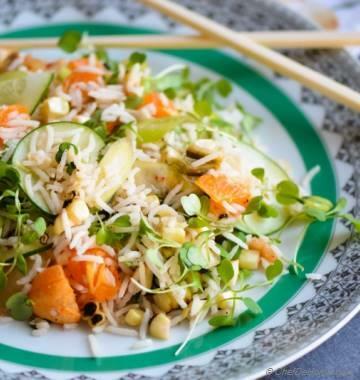 Every ingredient in this salad contribute to the deli-fresh taste and texture. Seriously, when I first made this salad, I was overjoyed sniffing that same deli-style aroma, texture of pasta, crunchy bell peppers and zucchini, juicy tomatoes, with bites of cheese, briny olives here and there.. oh yumm! even writing this makes me hungry! Deli-style pasta salads often have dried or cured meats. However, I decided to keep it vegetarian so every one can get to enjoy it. You know the "golden rule" for party food? Always make vegetarian options double the meat/poultry! Why? Because everyone would like a taste of vegetarian sides, so these will disappear faster. 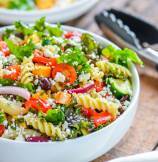 A delicious pasta salad like this one will disappear even sooner! 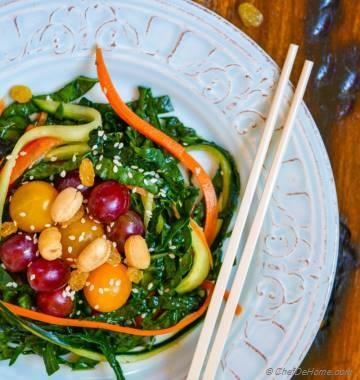 Honestly, once you make this salad, you will wonder just like I do... why don't deli-style pasta salads have kale? Last weekend I made a big batch of this kale Pasta Salad. 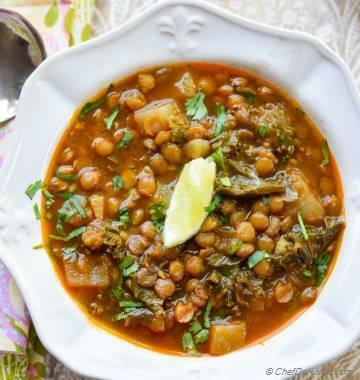 For two reasons - first to share this recipe with you and second to enjoy leftovers for lunch on weekdays. Due to lot of veggies and dressing mixed in with pasta, pasta does not sticky together and stays nice and fresh for up to 2 days. In fact, I'm still enjoying a batch from Sunday's cooking on Tuesday. Sounds awesome, right? 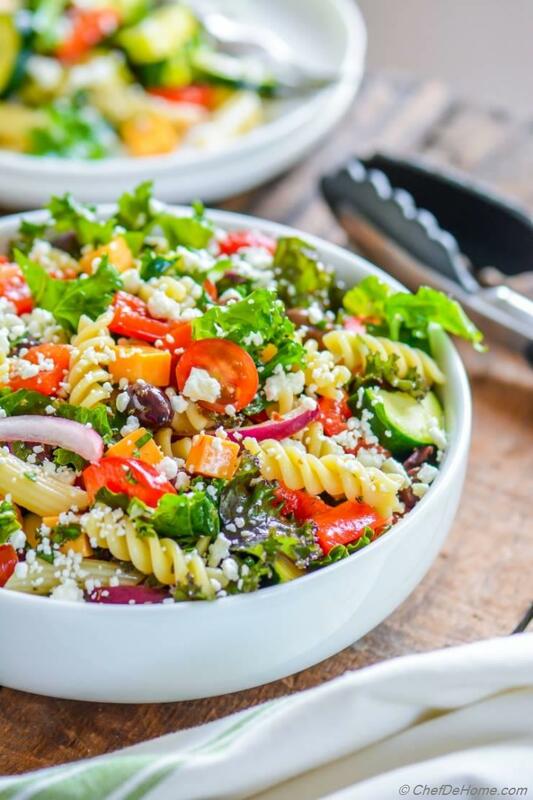 You can make deli-style pasta salad using fresh and good quality ingredients, at home in 20 minutes and make it ahead too to save some time on day of the event! Sounds super cool too me! Actually, if you ever try to carry Pasta Salad for a potluck, remember there are few ingredients which make a potluck pasta salad, "the best pasta salad" ever! 1. Good Dressing: First and foremost, a flavor packed dressing. Like for this salad, I have used Mustard Red Wine Vinegar dressing which gives salad a delicious zing and tongue tantalizing taste. 3. Crunchy Vegetables: such as red bell peppers, zucchini, celery! 4. 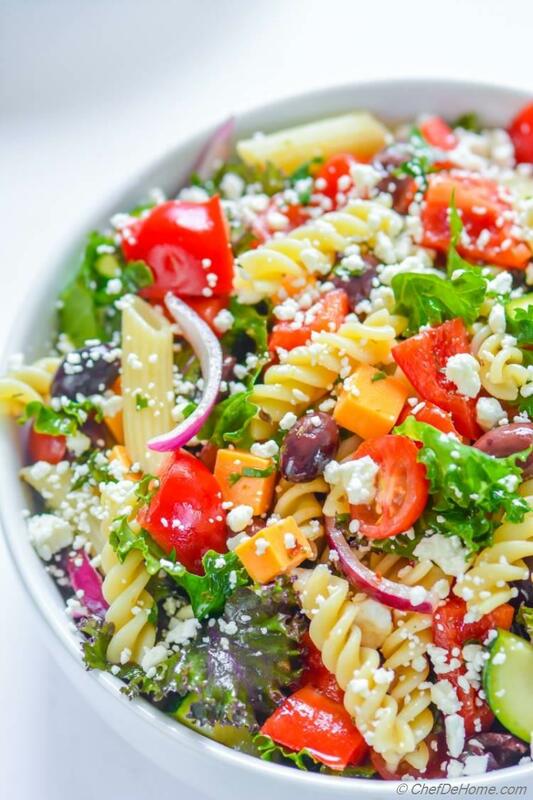 Balance of flavors: Addition of olives, cheese such as feta, Parmesan, provolone, cheddar enhances the flavor of veggies and also compliment the pasta. 5. Lots of colors: Choose a colorful range of produce. From kale to zucchini, all crunchy sturdy greens and vegetables go great in cold potluck salads. This pasta salad is best when served cold. So I highly recommend, refrigerating fresh mixed salad batch for few hours to marry the flavors. If you are not ready to mix salad until the day of potluck.... dressing can be made ahead too and refrigerated for 3-4 days. Just whisk well before tossing in salad. I hope you having blast this week! With St Patrick's Day around the week, I'm sure everyone is excited to party and have fun. If you hosting a potluck or visiting one, don't forget to pack this delicious salad to take along. Total Time 20 minutes Prep Time 5 minutes Cook Time 15 minutes Difficulty Easy Yields 4-6 Servings Serves 4 Notes No. of servings depends on serving size. 1. In a bowl, add all dressing ingredients but oil. while whisking continuously, add oil at a slow stream to emulsify. Season with salt and pepper. Set Aside. 2. Bring a pot of water to rolling boil, season with salt, add pasta and cook 10-12 minutes or until al-dente. Drain pasta water, run pasta through cold water, add in a wide pasta bowl with 2 tbsp of dressing (this prevents pasta from sticking together while rest is ready).set aside to cool completely. 3. In a large salad bowl, add all chopped salad ingredients. Drizzle Italian Vinaigrette Dressing over salad. Top with 1/2 of crumbled feta. 4. Toss to combine all ingredients just before serving. Serve and enjoy!